Linlithgow Rose lost further ground in the Super League as league leaders Kelty Hearts widened the gap between themselves and the Prestonfield club to 15 points. Before the match, Rose boss Danny Smith had labelled it a “must-win” match, but hopes were soon dashed as home goalkeeper Scott Christie was sent off after just four minutes. Linlithgow do have three games in hand over Kelty, but Rose captain Adam Nelson believes they’ll have to win those games in order to have any chance of securing the league title. He said: “We’ve got a few games in hand, but we are playing catch up already and it’s not even Christmas. We just need to go on a run now – we’ve done it before and we can do it again. We’ve struggled at home this season and we just can’t seem to put our finger on it – away from home we’ve been different class. Referee Scott Lambie was given no option but to show Christie a red card after the Rose keeper rushed out of goal in an attempt to clear, but instead missed the ball and clattered into striker Sean O’Neil 25 yards out. Despite their early setback, Rose came closest to getting the opener on 15 minutes. Nelson whipped in a corner which flashed across the goalmouth with no takers. Kelty’s Brian Ritchie then fired over substitute keeper Michael McKinven’s goal frame after he met Roger Duffin’s low cross first time. Rose then appealed for a red card to be shown to Kelty player-manager Tam Courts after the defender clashed with Michael O’Byrne, with the Rose player going down holding his face, but referee Lambie showed each player a yellow card. Minutes later Courts brought down Tommy Coyne on the edge of the box and presented the home side with a dangerous set piece opportunity, but Colin Strickland could not get his free-kick on target. The home side had coped well with their man disadvantage in the first period, but a 15-minute spell in the second half won the match for the visitors. Midfielder Conrad Courts grabbed the opener on 53 minutes when he latched onto Ritchie’s through ball before lifting a delicate lob over McKinven. Buoyed by their lead, Kelty had two more opportunities for a second before it came on 65 minutes. Linlithgow keeper McKinven will feel he should have done better after he looked set to take Ritchie’s low cross safely, but he let slip and Neil McCabe took full advantage. The Super League’s top goalscorer, Stuart Cargill, must have thought he had put the league leaders three goals to the good three minutes later as the visitors were relentless in seeking to add to their lead, but McKinven did well to tip wide. With Rose struggling to contain the extra man, they were getting pushed back further and further and it was no surprise when Kelty made it three just short of 70 minutes. Conrad Courts’ cross found the unmarked O’Neil who nodded past McKinven. Linlithgow defender John Ovenstone pulled one back with 15 minutes remaining with a neat finish from Nelson’s free-kick. 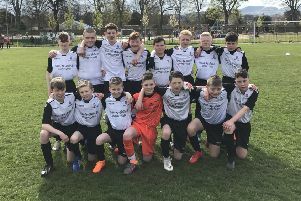 The goal gave the home side a glimmer of hope, and they did have chances late on, but Kelty marched on to remain unbeaten in the league. Kelty will take some stopping at the top of the table. They host champions Bo’ness United this weekend – the only side to beat them this season, in the Junior Cup, but a win, like this one, would send out a message to their title rivals that they won’t be budged off top spot easily. Rose boss Danny Smith admits the league table doesn’t make good viewing for his side, who sit in eighth place, but feels there is a long way to go yet. Linlithgow Rose: Christie, Wilson, McKillen, O’Byrne, Ovenstone, Nelson, MacLennan, Shirra (Batchelor), Strickland (Kelly), Coyne, Smith (McKinven). Kelty Hearts: Allison, Duffin, Leighton, Hughes, Tam Courts, Conrad Courts (Manson), Ritchie, Morrison, O’Neil. Cargill (Grady), McCabe.